With keen eyes and a regal air, Molly sits and surveys the work going on around her. 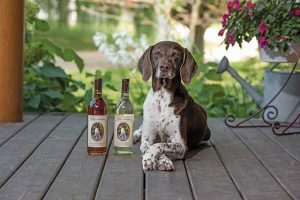 Her family members, Art and Colleen Stender and their son Jason, are all hard at work making the fresh fruit wines that are produced at Molly’s Winery in La Crescent, Minn.
Molly, whose registered name is “Texas HoldEm Molly,” is the Stender family’s German Shorthaired Pointer, and as queen of the winery, her name and photo are on the label of each bottle of wine produced there. Molly, 12, has been a part of the Stender family since she was a pup. In her younger years, she hunted pheasant and quail alongside Art and Colleen. More companion than sporting dog now, Molly enjoys quiet time with her family, preferring to sit with Colleen while she has her morning coffee, to relax in the living room recliner, or to observe the activity in the yard from the front porch of the Stenders’ log home. And it is this scene—Molly sitting on the front porch—that Colleen captured and that became the photo for the Molly’s Winery label. In the photo, she is surrounded by hydrangeas in full bloom, her ears are perked, and she has a rather self-assured expression. Colleen snapped the photo four years ago, just as husband Art was beginning to dabble in winemaking. Art says he couldn’t keep up with the “give-away program,” so he sought commercial outlets for the wine. Molly’s Winery wines are available in area liquor stores, including Buddy’s Liquor in Eyota, Preston Liquor in Preston, TJ’s Liquor in Spring Valley, HyVee in Winona and Discount Liquor in Lake City. Art continues to introduce new flavors, like black cherry and raspberry/rhubarb. He’s added a caramel apple flavored wine for the fall. When the wines began to be sold in area stores, the Stenders turned to professional printing for the labels. Prior to that, the labels were printed using their home computer. The professional printer added paw prints and a descriptive quote about the fruit included in the wine. The Stenders say there was never any question in their mind as to what the name of their winery would be. Molly has been their constant companion through the years, and though they have had other dogs, there is just something extra special about her. It is clear Molly is an important part of the family business. “We say this is a three-people-and-one-dog operation,” Art says. These days, Molly has an added duty: She is helping Art and Colleen train a new pup. A new German Shorthaired Pointer pup named Freckles has joined the family. Holly Galbus is a Rochester area freelance writer who often writes about the bond between pets and their people.